Please make a careful note of our instructions. Only use the measuring spoon provided, and ensure doses are accurate. Wash your hands before preparing feeds. Sterilise bottles, teats and other items by boiling or using an approved appliance. Pour the required quantity of boiled then cooled water into a sterilised feeding bottle. Add the required number of level measuring spoons of Bambinchen milk powder. To do this, loosely pour the powder onto the spoon and smoothen with a knife. 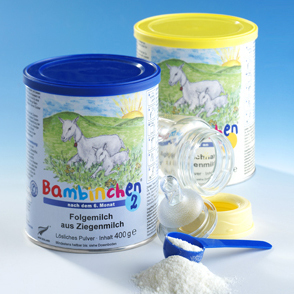 Always add one level measuring spoon of Bambinchen milk powder per 30 ml water into the feeding bottle. Firmly seal the lid onto the bottle, and dissolve the powder into the water by shaking vigorously. Make sure the volume of prepared formula is greater than that of the water added. Check the formula’s temperature before feeding by placing a few drops on your wrist. Please note! Bambinchen contains the natural milk sugar known as lactose. Frequent or ongoing contact between teeth and foods or liquids containing carbohydrates may cause dental and other associated damage. For this reason, do not give your child the bottle as a comforter; use it only for actual drinking! Please dispose of any leftover formula. Never warm the formula up in the microwave! The intake per bottle may vary from baby to baby. The recommended intake serves as a guide. Golden Goat full-cream goat’s milk powder can be used for babies over 2. To make 250 ml of delicious goat’s milk, take two heaped tablespoons of Golden Goat powder (25 to 30 g), and add 225 ml water. The opened pack should be stored in a cool place, and used up within 4 weeks. Golden Goat goat’s milk can be used as a substitute for cow’s milk. Apart from being consumed on its own, it is also ideal for cooking and baking. The powder comes in 400-g packs, which is enough to produce approx. 4 litres of full-cream goat’s milk.